We Drink Your Milkshake! 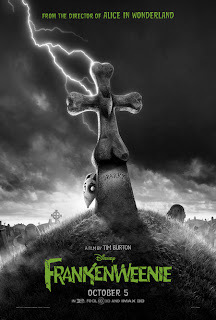 : FRANKENWEENIE Trailer Hits And I Can't Wait! FRANKENWEENIE Trailer Hits And I Can't Wait! Javi here. Up until the whole "remake/ dark remaining fairy tales" phase of his career, I was a pretty big fan of Tim Burton. To say that I have no excitement for whatever unfortunate Johnny Depp collaboration he has coming up is an understatement. However, I am glad to see that he is coming back to the animated realm with a feature-length version of his short, FRANKENWEENIE. Thanks to Yahoo, via Badass Digest, we have the trailer here. Check it out after the break. This trailer makes me want to forgive him for ALICE IN WONDERLAND. Between the old-school animation to the all black and white trailer, this makes it just feel like home. And seriously, who wouldn't want to bring back their pets back to life? It's such a fun premise. FRANKENWEENIE comes out October 5th, 2012. It is directed by Tim Burton, and stars Charlie Tahan, Winona Ryder, and Catherine O'Hara.